Duke guard Luke Kennard was expected to fill a complementary role this season, but he's emerged as the Blue Devils' top player. DURHAM, N.C. — Family vacations typically take the Kennards to Lake Cumberland, which is technically the ninth-largest reservoir in the United States, a halcyon spot that’s a four-hour drive from home in Franklin, Ohio. At the three-bedroom getaway house about a mile from the lake’s south shore, ensconced in the quiet of South Central Kentucky, everyone can boat or ride four-wheelers or just put the phone aside and, even when the extended clan is on hand, dissolve into the stillness. Last summer, though, there was an urge to take a separate trip with a smaller cast, a nuclear family-only excursion. So Mark Kennard polled his two children for suggestions on destinations. Should it stun anyone that the player most responsible for keeping Duke afloat this season has a soft spot for roller coasters? 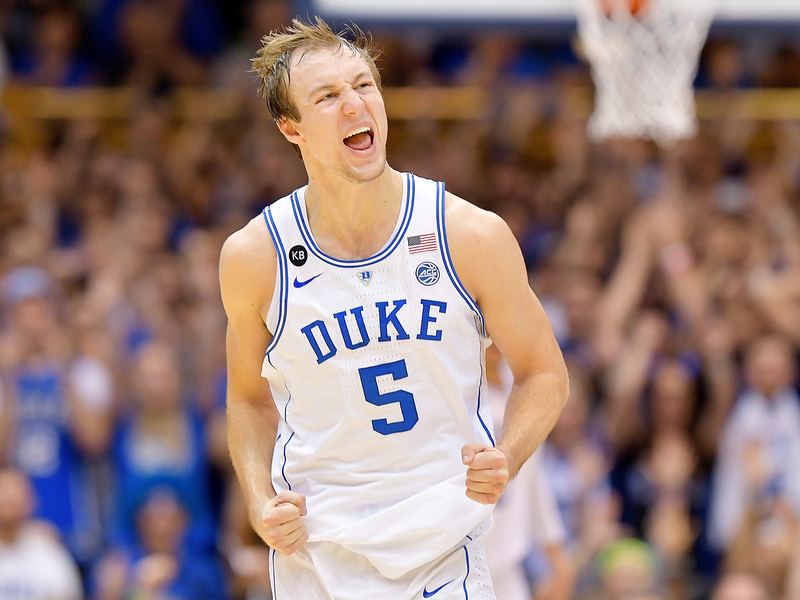 No, nobody on the roster has done more to steady the Blue Devils during the relentless turbulence of injuries and suspensions and drama than Luke Kennard, a metronomic 6’6” All-America lefty who leads the team in scoring and, unofficially, fewest hairs grayed. He is uncomplicated (“A no-maintenance guy,” per Duke coach Mike Krzyzewski) during a period when anything uncomplicated counts as a blessing for this program. He is normal. His production and reliability are not. It’s a Thursday in March and there’s a sociology class at the top of the hour, so Luke Kennard brings breakfast with him to the media room at Cameron Indoor Stadium. The spread consists of one plastic cup he sets on a table. From the looks of it, the viscous, beige liquid inside could be a protein shake. The vitamin-rich concoction of a trainer or nutritionist, probably. This is the most important meal of the day, expertly calibrated to fuel one of the most valuable performers in the country: A guard who has the third-highest offensive rating (129.5) of any player who has used at least 20% of his team’s possessions, per kenpom.com, as well as a Win Shares total (6.5) that ranks fourth in the nation. Naturally. He is from a pin-dot town of 11,000 residents that just about splits the distance between Dayton and Cincinnati. He had cookouts with friends and swam in his Grandma Louise’s pool between games of corn hole in her backyard. He had an annual pass to the local amusement park, King’s Island. He ate at A&G Pizza House. He took trips to the lake house with his family. He was a basketball point guard and a football quarterback and he was very good at both, winning Ohio’s Division II Offensive Player of the Year award after throwing for 26 touchdowns as a junior (He then dropped the sport to concentrate on basketball). The self-evident athletic talent aside, everything about Luke Kennard seems so resolutely typical. His backstory is basically short on story. He became a coveted prospect at the Peach Jam tournament the previous summer, where everyone agrees Kennard’s emotional dam broke for sure. But not because he was overcome when his family was notified that the likes of Krzyzewski and Kentucky’s John Calipari were on hand to evaluate him, specifically. “Jennifer and I, we’re probably sick to our stomachs,” Mark Kennard says “And Luke’s walking around eating a hamburger, not even worrying about it.” The ripple in the calm came later during the event, when Duke, Kentucky and Michigan State offered scholarships on the same night, via phone calls from the programs’ three luminary head coaches. “I honestly didn’t know how to react,” Luke Kennard says. His father has a different memory: “We had to do three happy dances,” Mark Kennard says. The offers were merely further confirmation that Kennard’s steadiness cannot be mistaken for nonchalance. He was doing Pete Maravich ball-handling drills with his father, a former player for NAIA Georgetown College, as a kindergartener. Then there is the well-worn yarn about Mark’s solution for Luke’s refusal to dribble with his non-dominant right hand as a grade-schooler. Three days a week, for about 45 minutes at a time, the two migrated to the playground court at nearby Schenck Elementary School to break the habit. Mark banned the left hand for these sessions. And to cover the three-block trip home, Luke dribbled along the sidewalk with his right hand exclusively, his other hand behind his back, while Mark kept pace on the road in the family’s blue Ford Expedition. “My wife called it child abuse,” he cracks. If Luke switched hands, they returned to the school and restarted the walk. Even on that Disney vacation last summer, Luke twice stole away to shoot at a local high school, with his father in tow. There was no use in attempting to keep the trip strictly to theme park visits and sitting idly by a pool. 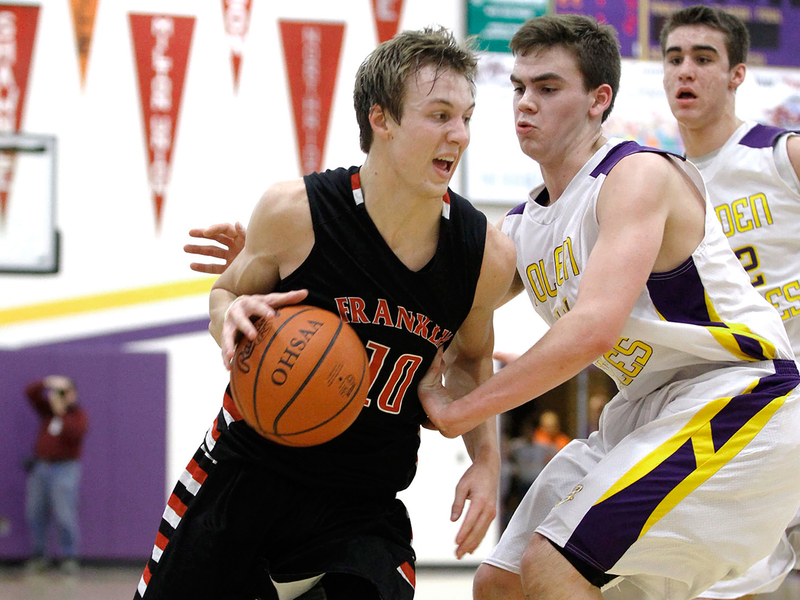 Luke Kennard knew he’d find a gym, because he knows who he is. A few months later, that last part would help save Duke. Kennard heard the same counsel from his father and his high school coach before he even matriculated to Durham. The advice was meant to help Kennard manage the attention that, for better or worse, inevitably trails a Duke player. This year it helped Kennard stitch together a team fraying all over. His generally tranquil presence has been a touchstone as the Blue Devils scrambled for anything to rely on. Kennard’s performance imbues him with authority almost by default; Duke would be adrift without him, so teammates almost have to follow his lead. But privately, he’s likely enhanced his standing simply by being emotionally consistent and loyal. “I try to build guys up,” Kennard says. “Always trying to communicate when we hit adversity and keep people up.” After Allen was disciplined for his infamous trip of Elon’s Steven Santa Ana on Dec. 21, Kennard spoke to his father and voiced serious frustration—with the public at large. Dad, Mark Kennard recalls his son saying, I don’t want to hear one person say one bad thing to me about Grayson. It has become Duke’s new and entirely necessary normal. Arguably, Kennard’s emergence as a superstar gunslinger could be categorized as yet another anomaly in a thoroughly irregular year. It wasn’t supposed to happen. But given all the commotion, it likely needed to if the Blue Devils had any hope of navigating the chop and eventually measuring up to the expectations heaped upon them. They had to be led by the guy who requires no time to think when asked to name his favorite theme park ride (The Incredible Hulk Coaster at Universal’s Islands of Adventure), the chocolate milk aficionado whose lone idiosyncrasy might be that he shoots left-handed and throws right-handed. “That always surprises people,” Luke Kennard says. He’s almost out of ways to do that.